Images of the inside of Dave's Car's Engine!!! see the round metal on plugs 2 & 3 are still a bit discolored from it. 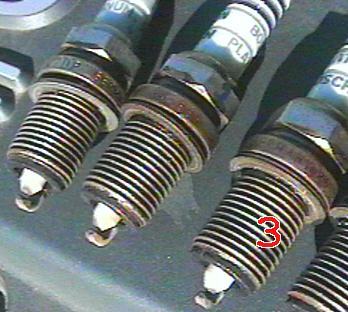 The center electrode insulator on plugs 1, 3, and 4 look too clean white, which is probably due to overheating. Plug 2 is better. Plug 5, which has some tan-brown powerdery deposits, is probably closest to ideal. 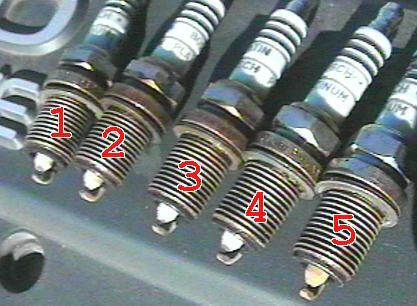 This is strange, as the original (different kind of) plugs looked very nearly identical when they finally came out (late), but plugs 1 and 3 had the greatest amount of tan-brown powdery deposits, and plug 5 had the least at that time! Insulator on plugs 1 & 3 are too white and slightly scorched, though not at all melted. Plug 4 is also too white; 5 is not as yellowish as it looks here. Since replacing these plugs there is a very slight, subtle improvement in acceleration, most noticeable at very small throttle openings. Nothing unusual there. However, when I back off the throttle, engine compression braking seems very slightly increased, which suggests to me that at least one of the plugs was no longer completely sealing its combustion chamber! Also, even though I'd checked the tightness of the top-of-plug screw-on plug wire connectors prior to installation, none of them was more than finger-tight when removed. So the replacements were tightened more aggressively. Last, while I've usually waited for an engine to cool down to warm before removing plugs, I changed these after the engine sat unused overnight, and the plugs did not come out as easily as I'd hoped. So the replacement plugs got a more liberal application of anti-seize compound this time, and will be removed from a still-slightly-warm cylinder head next time. 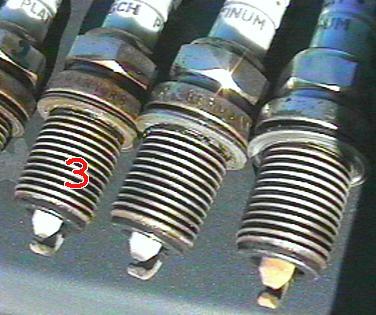 PS: Apparently, the bonehead mechanic had failed to adequately crush the gaskets (note #2's thin sealing circle in the last image) when these spark plugs were installed (shame on me!!) which allowed some leakage, which induced leaner mixtures, causing elevated combustion chamber temperatures. Plugs 1-4 survived (well) a real trial-by-fire! The insulators got a little scorched, but they completely and perfectly protected the center electrodes from melting and rounding, which leads to higher firing voltage requirements (which leads to misfires).